I'll be speaking about my work at this coming Saturday's Masscribes Holiday Gathering in Norwood, MA. 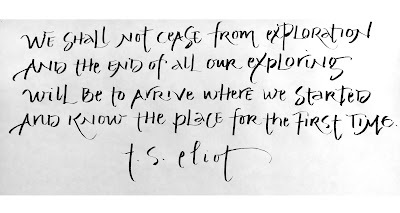 This quote from T. S. Eliot's poem Little Gidding will be the opening slide. I did the calligraphy with the folded pen I made in Carol DuBosch's wonderful Folded Pen Adventures workshop at Masscribes. 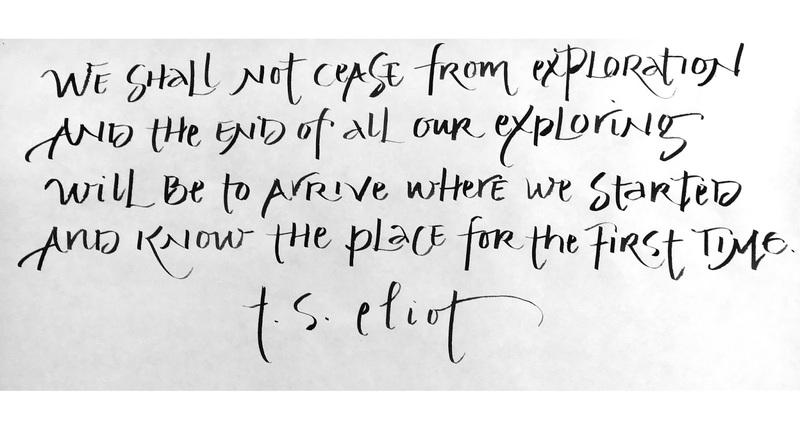 I'll be talking about how and why I fell in love with calligraphy almost forty years ago, how and why I fell out of love about ten years later, and how I have come back again with a new and joyful spirit. As with my work, I like to have my talks evolve organically. I never write anything down. I build the presentation by talking to myself and pairing the talking with images. I may also try to put these thoughts into an essay but that is a separate process.